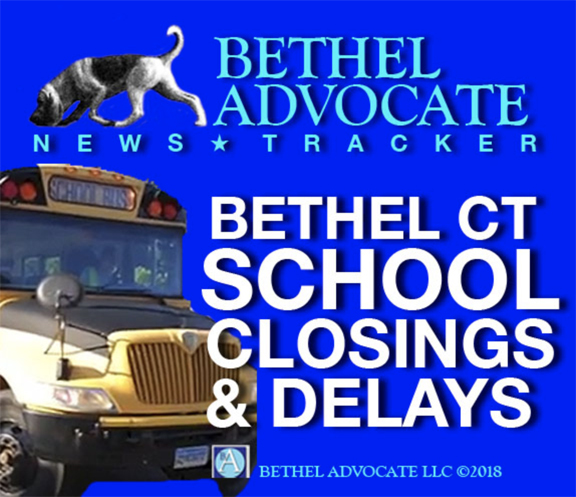 Message from Bethel Public Schools: Due to the weather forecast, BPS after school activities are canceled, today, Tuesday, January 29, 2019. PRECAUTIONARY/PREPAREDNESS ACTIONS…A Winter Weather Advisory for snow means periods of snow will cause primarily travel difficulties. Expect snow covered roads and limited visibilities, and use caution while driving. Check local Department of Transportation information services for the latest road conditions. This Hazardous Weather Outlook is for southern Connecticut, northeast New Jersey and southeast New York. Snow likely before 4pm, then rain. High near 36. Wind chill values between 25 and 30. Southeast wind around 7 mph. Chance of precipitation is 90%. Total daytime snow accumulation of less than a half inch possible. Rain and snow, becoming all snow after 11pm, then gradually ending. Low around 20. Southeast wind around 7 mph becoming west after midnight. Chance of precipitation is 100%. New snow accumulation of around an inch possible. Scattered snow showers after 1pm. Increasing clouds, with a high near 23. Wind chill values between 5 and 10. Southwest wind 8 to 15 mph, with gusts as high as 31 mph. Chance of precipitation is 40%. Mostly clear, with a low around -1. Wind chill values between -5 and -15. West wind 9 to 16 mph, with gusts as high as 30 mph. Sunny and cold, with a high near 14. West wind around 11 mph.